Inside (definition): the inner side or surface of a thing; situated on or in, or derived from, the inside; situated within the confines of (something). Kentler International Drawing Space, with its objectives of promoting dialogue and expanding the conversation around art and accessibility, provides opportunities for artists, curators and the community to really think about what role art plays in our lives. 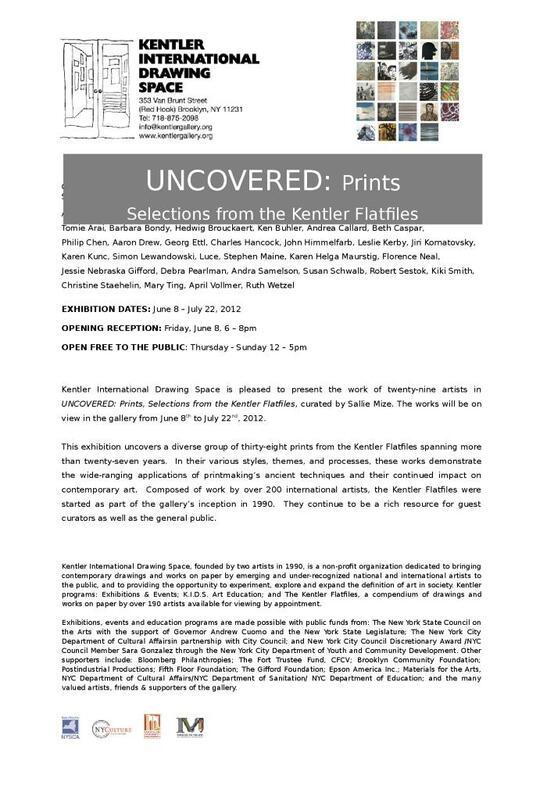 A central element of the Kentler, the Flatfiles are a resource like no other—a repository of works on paper by up to 200 artists from all over the world. The democracy of a space like the Kentler encourages curators to embrace the diversity of artists and approaches while finding the commonalities in the work. Though the variety of work is incredibly broad—in media, in format, in technique—I came away from my time in the Flatfiles with a sense that many artists are grappling with the concept of interiority. 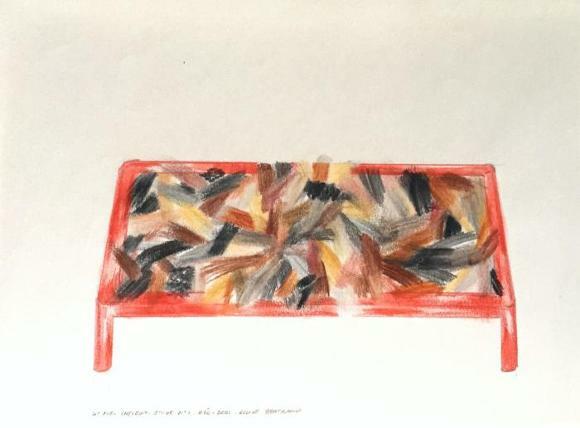 The works selected for Inside Out can all be traced back to ideas and concepts of “inside,” whether in space, in body, in situation, in process or in mind. Specifically, throughout the show the works reflect “inside” or an interiority that is seen literally in representations of physical spaces, abstractly as a boundary or confines providing infrastructure; as well as influenced by the natural infrastructure seen in organic material and explored through the human body and condition. Many of the works in Inside Out involve literal representations of interior space and its inverse—exterior or outside space. For example, the nine drawings by Ernst Benkert, all part of his prolific series Burned Out Churches (2004), engage the dual role that physical spaces can inhabit. The repetition of basic, almost abstract triangular forms in this series are suggestive of the nature of churches as places of private worship (interior) and public gathering (exterior). Prints from the Salzburg Portfolio (2001) by Maddy Rosenberg also show the connections between interior and exterior spaces. In Piecemeal, No Exit and GatewayRosenberg illustrates the architectural structures—doorways, hallways and windows—that are also portals to the outdoors. There is a quiet solitude seen in the three interior prints that is echoed in Jagged Edge, where the singular rocky formation stands alone. Sascha Mallon’s complex drawing weaves a surreal narrative of interior and exterior spaces full of dark corners. Her drawing is a world of multifaceted characters that intimates her interest in storytelling and externalizes an internal dialogue. Referencing the artist’s memories of cityscapes, neighborhoods and skylines in Suspended City (2005) Claudia Sbrissa turns the conception of an urban city upside down. The inverted buildings in the drawing turn not only toward the ground, but also into themselves, the opaque windows keeping the interior spaces a mystery. “Inside”—also defined as being situated between confining boundaries—can be interpreted as an organizing principle. 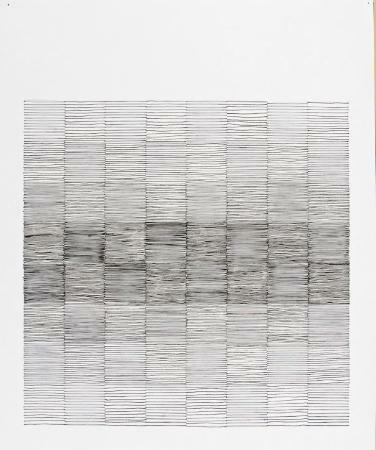 Repetition, line and the grid are particular principles of composition seen in the work of many artists in this show. Externally applied, the grid and repetition of form are interior limits that can provide pressure, rules and boundaries for the artist to work against—an often necessary element in creation. In Elizabeth Duffy’s 0% APR (2004 and 2005) the grid is a man-made structure provided by the found objects that she works upon (envelopes with data protection patterning). 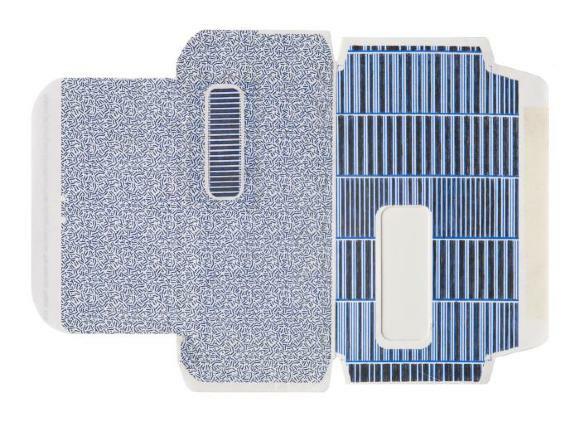 Duffy not only turns the security pattern inside out, negating its purpose, but also works on top of the existing patterns, turning the security into drawing. For Marietta Hoferer the grid is a starting point. 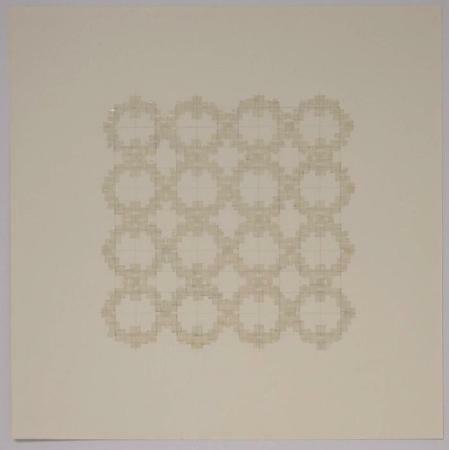 However, in works such as Small Crystal (2006) layers of tape point to a thoughtful deviation from the strict organizing principle of the grid and create a pattern that is luminously monochromatic. 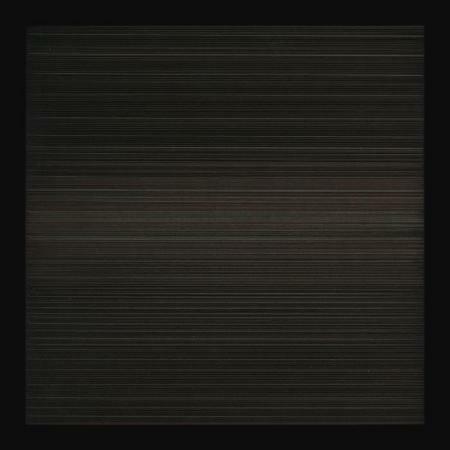 Robert Lansden uses the repetition of line and the suggestion of a grid in Dream (2008) to create visual texture that engages the viewer within the entirety of the composition. Engaging the viewer in what she calls “a visual game” Audrey Stone’s work with thread and ink, also employs line and pattern based on a grid. 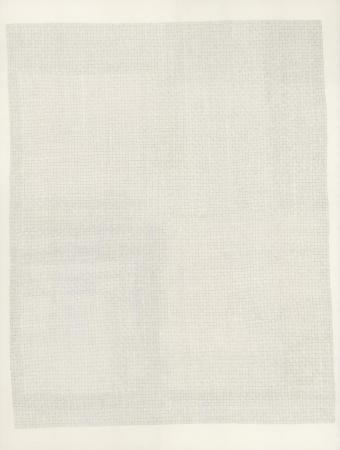 In#18 (2009) the game that she has created juxtaposes the static lines of ink on paper with varying dimensions and physicality of thread sewn through paper. Barbara Bondy’s screenprints Spectrum I and Spectrum II (both 2012)lay out precise and complex abstract forms that immediately call for mathematical or mechanical interpretation. 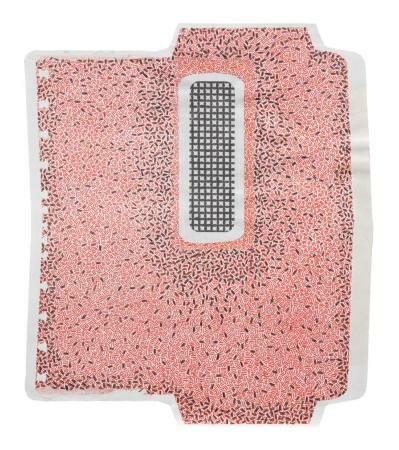 Bondy embraces the external limitations of the grid and the palette as tools to aid in the understanding of the interior complexities of the brain. 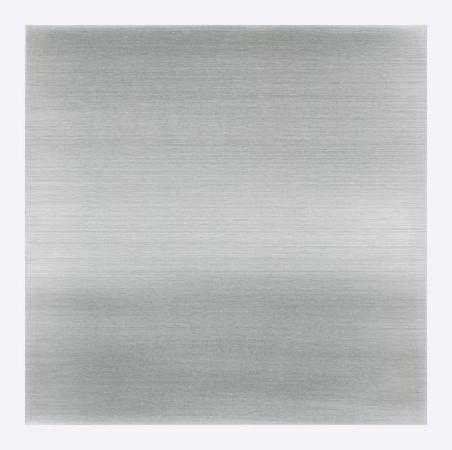 The minimalist format, repetition of line and monochromatic quality of Susan Schwalb’s metal-point works Aurora #2 and Madrigal #26(2010) belie the rhythm and candescence that the medium provides the physical works. Gahae Park uses the grid, and the patterns it inherently creates, to visually express music. In Music Drawing in Blue (2011), cut paper squares juxtaposed with an organic form below become an instrument of expression. Many artists included in Inside Out derive their subject matter and materials by mining the content of the natural world. Repetition and the grid are also principles that occur naturally in organic material and the cellular building blocks of all matter. The natural infrastructures found in forms as simple as cells and as complex as fully evolved organisms provide a broad range of areas to be explored in drawings. 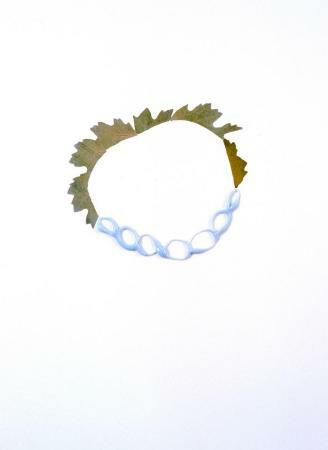 Grace DeGennaro explores concepts of seriality and symmetry in nature through the repetition of form. 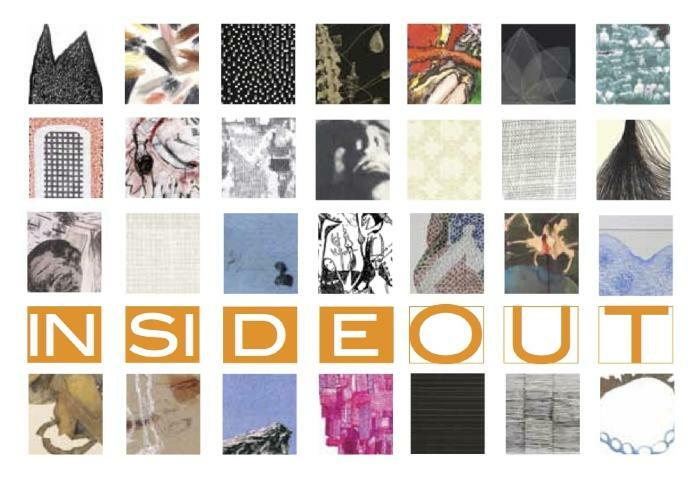 In Indigo #26 (2009) the geometric structures repeat themselves, creating a rich, mirrored image of overlapping forms. 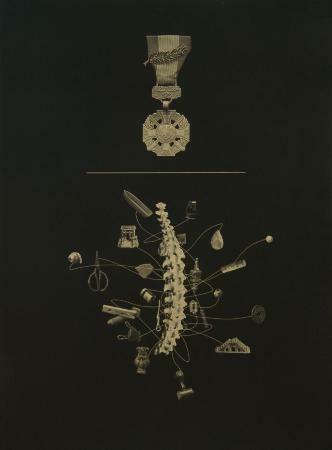 In Joanne Howard’s Vertebrae (2001) the repetition of the shapes is based on naturally occurring phenomenon, as implied by the title. 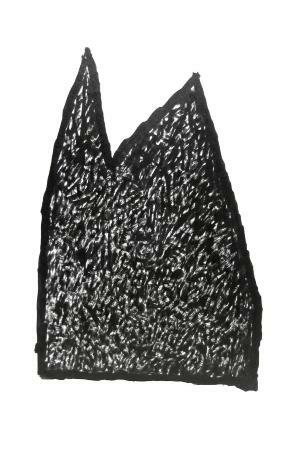 The abstract and personal feeling of this drawing betrays the actual external and natural patterning. Arezoo Moseni’s drawings embody an interest in organic form and scientific processes in every sense—biological and geometric forms are drawn using diverse media such as wine and photo-processing chemicals. 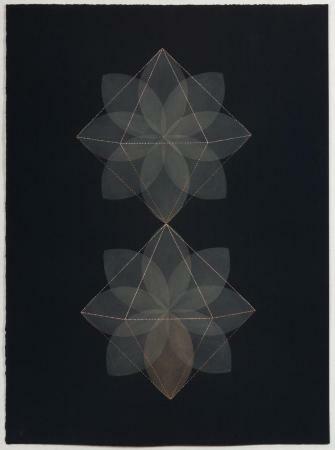 The latticelike lines illustrate an intricate interiority that hints at the complex inner life of these forms. 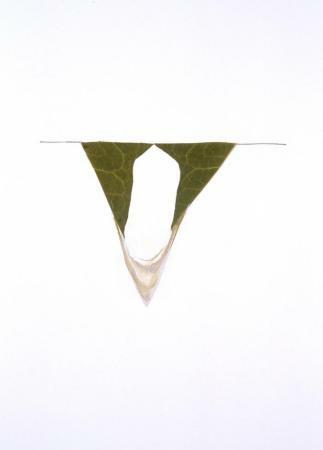 Ilene Sunshine also employs organic materials, but in her Leaf Series (1997-2000) these ephemeral elements are juxtaposed with synthetic materials such as plastic to create simple compositions that highlight the internal structures of the natural materials. Andy Ness combines organic forms and natural materials, like coffee, to create a fantastical, alien environment, while Beverly Ress approaches her subjects by looking closely at what’s in front of her and manipulating her direct experience in the work. 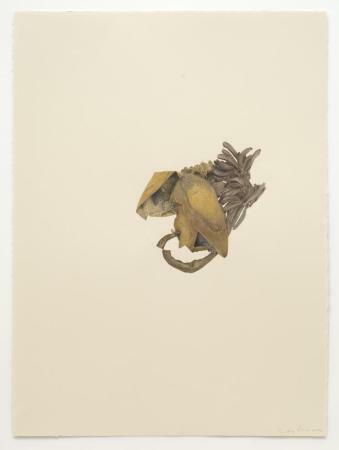 In the delicate and detailed drawingBananas (2006) one can make out the form of a banana turned inside out and abstracted, but still retaining its objectness. In Phillip Chen’s relief etching Paris (2006), personal reflections, cultural objects and historical narratives intertwine and recombine to illustrate the dichotomy of interior and exterior expression. 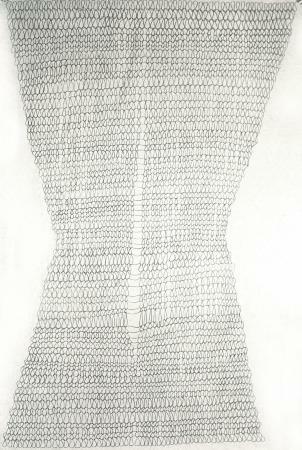 The rigorous technique of relief etching exposes Chen’s interest in constructing a composition that unites the vulnerability of the body’s interior and an exterior strength. Sherae Rimpsey’s drawings from the crote forms series (2003) include abstract figures that subtly hint at the violent action of cellular formations, organs and limbs—of interior forces acting upon an exterior body. 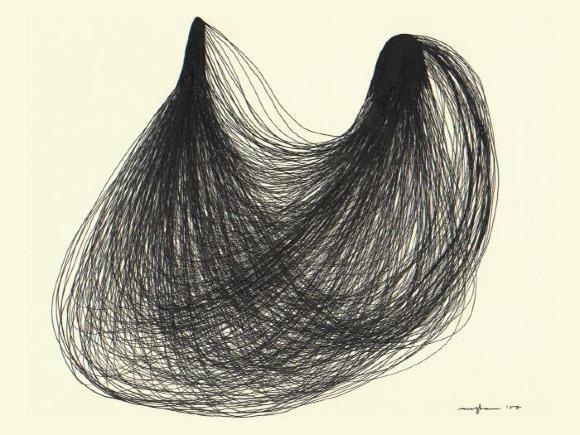 The lines of Meghan Keane’s Hair Sac (2007) reference a specific object in nature and suggest movement, showing the object’s resistance to exterior pressure or limitations. 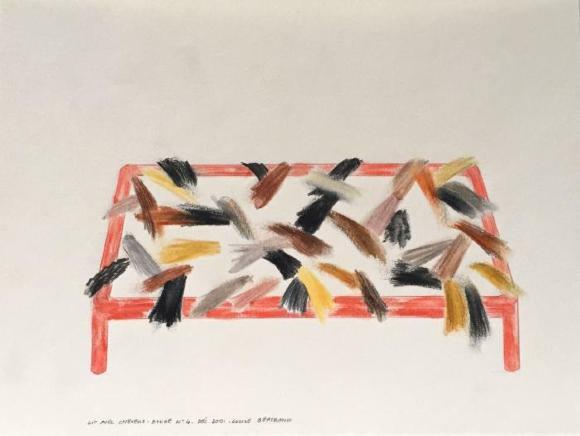 In her series of drawings Lit avec cheveux (2001-02) Lucile Bertrand also uses the lines and movement of hair to create a specific and personal interior space that feels intimate, yet energized and anthropomorphic. While many of the works in the Flatfiles are abstract or deal with the outside world, there is a strong collection of drawings, prints and photographs that take the human body as their subject. 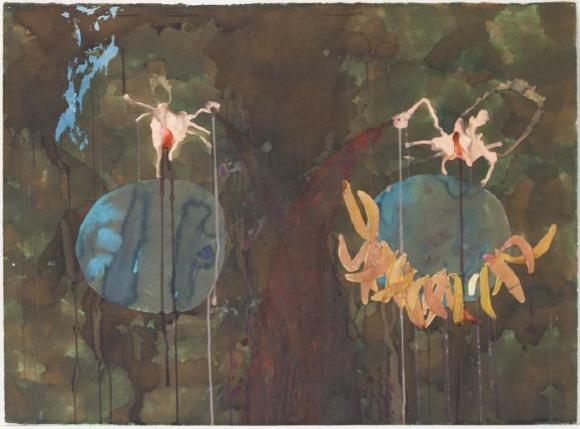 The group of works included in Inside Out that represent the body do so in many ways—singularly, en masse and even abstractly—and use the body as a springboard to explore internal conditions such as fear, unity, power and isolation. In his drawings Untitled (Shaking Head) and Untitled (Upturned Head) (both 2010) Paul Goss invites the viewer inside his subjects’ heads to see the psychic energy and inner turmoil they express while keeping the actual emotions ambiguous. Both Kalika Gorski and Karni Dorell also present ambiguity, employing repetition to veil the very specific actions of bodily figures. 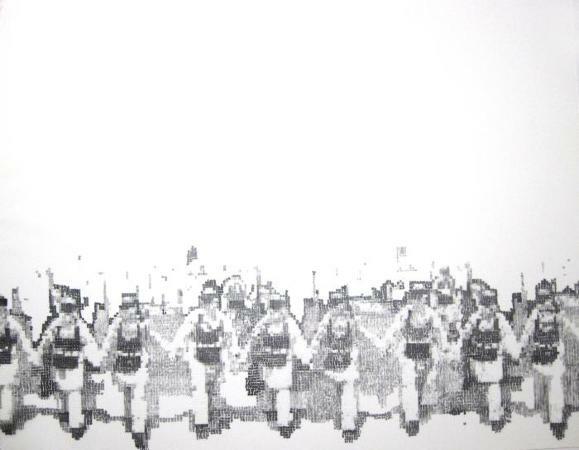 From a distance Gorski’s black-and-white drawing appears to be an abstract pattern, but upon closer examination the composition reveals figures lined up as in a parade or a brigade. 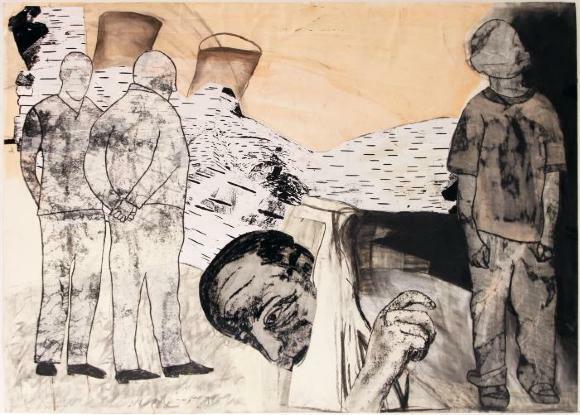 The title Line of Suicide Bombers (2006) indicates the underlying darkness of the work’s subject matter and its political undertones. 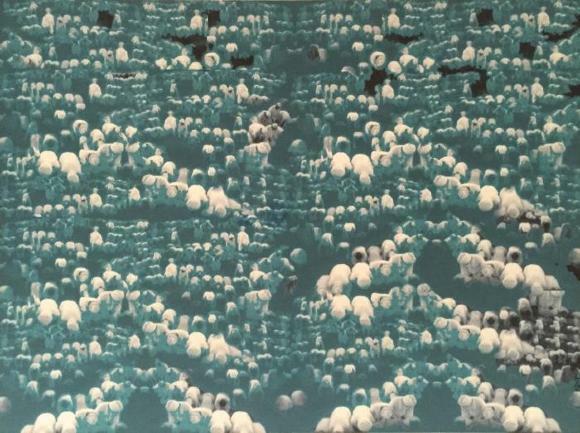 Dorell’s all-over pattern in the inkjet print Prayer Field (2007) gives way to a sea of praying figures, a reflection of the unifying and abstract nature of faith. In Tatana Kellner’s Untitled (2006) the subjects’ inner and outer lives are seen enmeshed here in a collage of materials and figures. The confusion of the faceless figures’ roles and their interaction with the anxiously sleepless central figure creates a scene of turmoil. 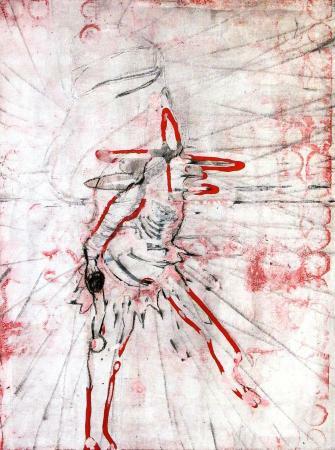 In Manuel Geerinck’s Untitled (DES17) (2004) an unidentifiable warrior radiates from the center of the composition in an aggressive stance of inner power. There is also an inner power emanating from the central female figures in Drew Curtis’s drawings Yellow Around: Woman and Plane and Woman in Red Jacket (both 2004). The figures sit calmly in repose, their alienlike features not affecting the sense that they are in control within their environments. In contrast, the figures in Les Nouvelles sont Bonnes (2003) by Luce Cleeren (LUCE) emit a sense of isolation and confusion even within the company of others. 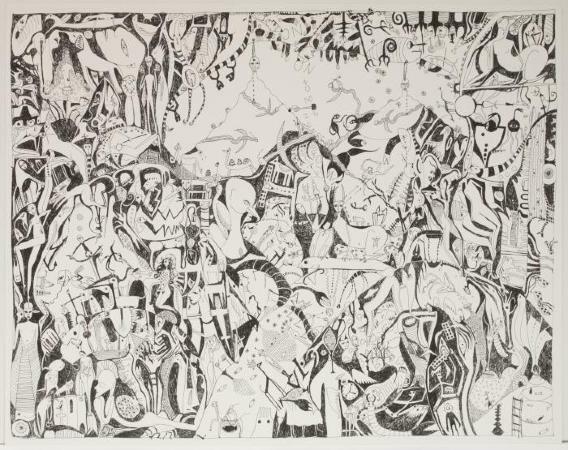 The starkness of the black figures and uplifted countenances in Cleeren’s etching contribute to a sense of seeking and internalization possible even within a community. 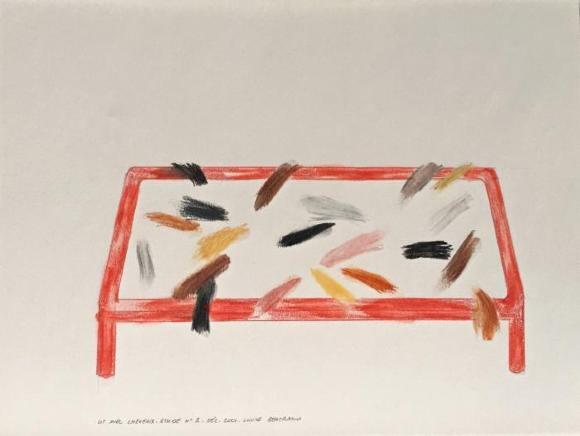 Though the 28 artists included in Inside Out have vastly different approaches to art making and conception, a thread connects the work and the artists’ reach. By looking at these artists and their work through the lens of “inside,” there are specific uses of space, situation, body, community and process that imply the engagement with interiority. The literal, abstracted and cerebral dialogue with “inside” that is seen in the groupings of works here does not stop at Inside Out, but is a dialogue that enriches and expands the role of art. Laura Phipps is Senior Curatorial Assistant at the Whitney Museum of American Art.